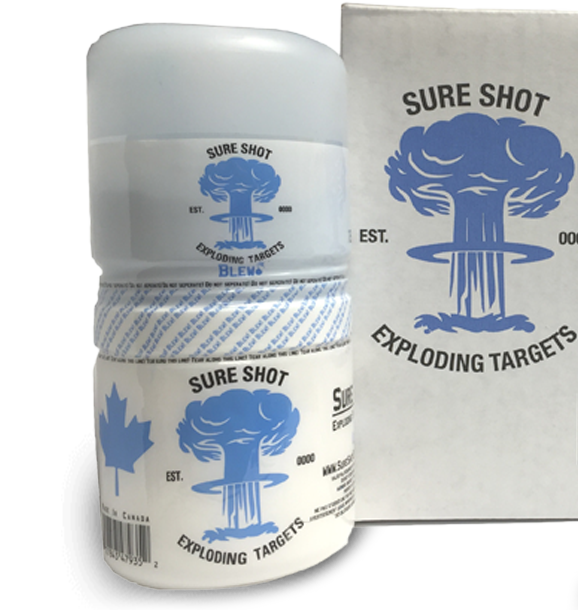 Sure Shot Exploding Targets are an all Canadian company. We are the only company whom have undergone independent testing within Canada. We were the first to produce a Rimfire Sensitive target, the first to produce a coloured target the “Blew!”and bring them to the Canadian market the “Rimfire Magnum” and the Blew! Are often imitated but never duplicated by our competitors. If you are going to use exploding targets shoot the original shoot Sure Shot! Our Standard 1lb binary targets are Canadian made, proudly produced in B.C these targets are far easier too see at a distance from any of the competition. We are the only target manufacturer that will Guarantee our product to have a 7 year shelf life on our Center-fire formula if stored properly and to be the loudest, most powerful, most consistent and most consumer friendly target on the market. We are the only company to offer a 1/2Lb .22 LR exploding target called The Rimfire Magnum. This target has undergone full testing in Canada and is proven to be very stable and safe. The Rimfire Magnum needs to be hit by a projectile travelling at least 1000fps and when activated is as loud as 2-3lbs of the other brands. The RimFire Magnum is often imitated but never duplicated by copycat companies. Don't accept the fakes get the original Canadian Rimfire Target. The Blew! Is the first commercially produced coloured exploding target in North America invented and produced in British Columbia the Blew! uses our unique breakaway system along with our Ego Powder the Blew! Leaves a trail up to 50ft in the sky leaving you no doubt that you have hit your target! 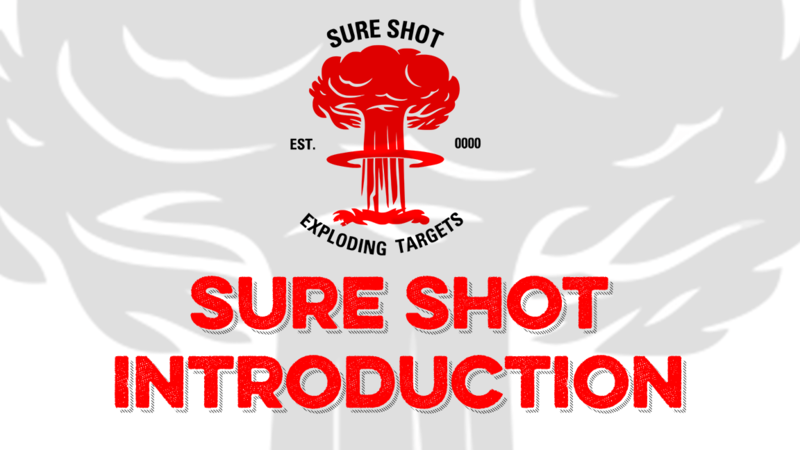 Watch our informative videos on so you can lear a little bit about Sure Shot Canada and how to properly mix and use our Rimfire and Centerfire Targets. Be sure to watch the Action shots to see Sure Shot Exploding Targets in Use. Give us a little information about your Exploding Target needs and we will get in touch with you shortly. Your name Email How Can We Help You? Q: What are Sure Shot Exploding Targets? A: Our exploding targets are made from mixing two separate chemical compounds and as such are called binary exploding targets. A binary explosive is the product of mixing two components that are not explosive by themselves, but when mixed together become explosive. 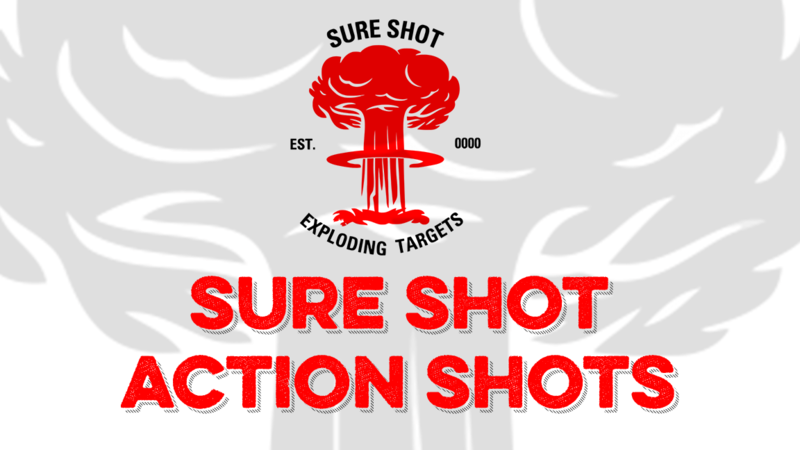 Q: How are Sure Shot Exploding Targets different from other exploding Targets? A: Here at Sure Shot quality and safety are our number one concern. Our product can be divided into three different parts; the oxidizer, the catalyst and the packaging. Oxidizer: Utilizing our oxidizer requires licensing with the ATF and the reason for that is simple, it is of a higher quality than other manufacturers. Our oxidizer is made from E1 grade Prill, which is a blasting grade component. The vast majority of other target manufacturers do not have the licensing required to use the blasting grade oxidizer that we use in our targets. Catalyst: Our catalyst is a special blend mixed in house and is of the same grade as our oxidizer. Many manufacturers use the same generic catalyst blend and for us that was just never an option. We understand that our customers want a product that will function as advertised every time with zero exceptions. We started development of our own catalyst blend because we strive for a quality product and also because we could. You got it, explosives research and development also requires being properly licensed by the government. That is why we can offer our Magnum line which is .22lr sensitive and the loudest binary target on the market. 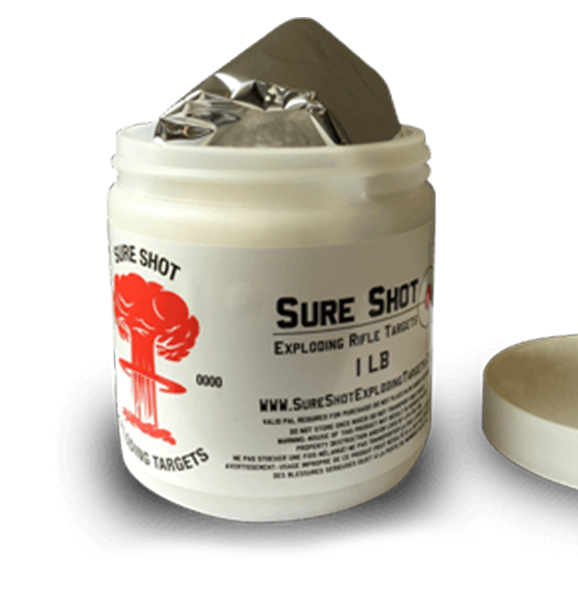 Packaging: Sure Shot exploding Targets carry a seven year warranty if stored properly. At the heart of this warranty is our packaging. We start by measuring both the oxidizer and the catalyst by weight and not by volume. For the customer that means a proper mixture for every target that will yield the same results when used in the same conditions. Our oxidizer is then sealed in a bag and our catalyst is double bagged and sealed for added protection. After that the sealed oxidizer and catalyst is placed in a weather resistant container with instructions and sealed for maximum quality assurance. Q: What type of targets are offered? 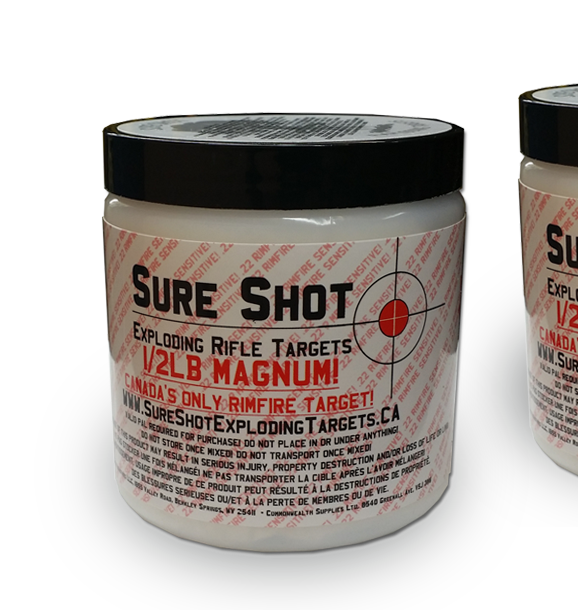 A: Sure Shot Exploding Targets come in three different product lines; Center Fire, Bulk Mix Kits and Magnums. We'll cover each respective target lines individually. Center Fire line: The Center Fire line comes in ½ lb, 1 lb and 2 lb containers. Each container is sealed and water resistant for long term storage. Once you break the seal you'll find a double bagged and weighed portion of catalyst. The Center Fire line requires a center fire rifle caliber of .223 rem or higher for detonation and a minimum range of 100 yards distance between the targets and shooters. Bulk Mix Kits: The Bulk Mix line comes in 5 lb, 10 lb and 20 lb boxes. Each padded and sealed box contains a sealed canister of double bagged catalyst and instructions detailing proper mixture and safety warnings. The Bulk Mix line also requires a center fire rifle caliber of .223 rem or higher for detonation and a minimum range of 100 yards distance between the targets and shooters. Magnum line: The Magnum line consists of ½ lb Magnum targets. These two targets utilize the same special catalyst formula, but the packaging is very different and as such we'll break them down further. ½ lb Magnum: The ½ lb Magnum comes in a container that is sealed and water resistant for long term storage. Once you break the seal you'll find a double bagged and weighed portion of Magnum catalyst, an instruction sheet detailing proper mixture and safety warnings, and a weighed portion of oxidizer. The ½ lb Magnum can be detonated with the .22lr round or a higher caliber round and requires a minimum range of 50 yards distance between the targets and shooters. Q: Are Sure Shot exploding Targets legal? A: A Sure Shot Exploding Target can be broken down to two chemical components. Part one is the oxidizer and part two is the catalyst. The federal government allows the mixture and use of up to 50lbs of our product. Once our targets are mixed they are considered by the ATF to be a high explosive. 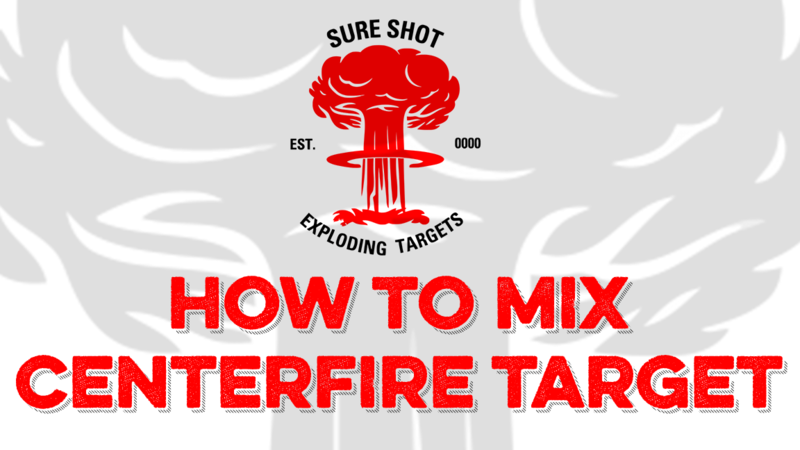 Users should always mix our targets on site as the targets must be detonated on site. 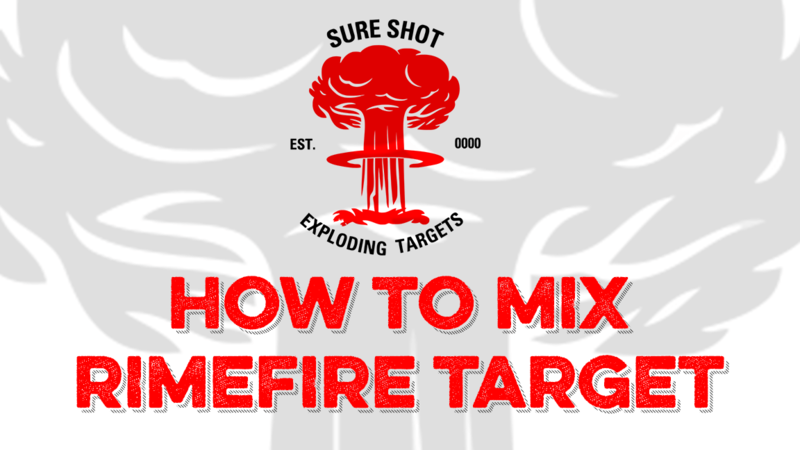 Do not mix Sure Shot Exploding Targets in advance and do not transport, or store them once they have been mixed. Transportation and storing of high explosives requires permits and adherence to strict federal regulations. Users are responsible for knowing their state and local regulations as well as assuring a safe and legal site for detonation. Exploding Targets are now illegal in CA and MD. How to play: Beginning on or about June 13, 2016 and until August 13, 2016 participating dealers (“Dealers”) will provide one official entry entry (“entry”) with qualifying purchases of Sure Shot Exploding Targets (“Targets”). One (1) entry will be provided for every Case (10 targets) Targets purchased. For example, a purchase of a Case (10 targets) Targets will receive one (1) entry. Entries must be legibly filled out by the entrant (“Entrant” or “Participant”) with his or her first and last name, address, and telephone number, at which time the Entrant shall be deemed to have participated in the Contest. The email address field on the entry is optional but recommended. entries may be returned to the Dealer who shall forward the entries at the close of the Contest to the Sponsor for drawing, or entries may be mailed by the Entrant to the Sponsor's address in Section 12. Purchases made online from a Dealer may be shipped with an entry from the Dealer for the Entrant to mail to the Sponsor, or be entered by the Dealer on behalf of the Entrant at the Dealer's sole discretion. The Sponsor reserves the right in its sole discretion to reject incomplete or illegible entries, entries believed to have been obtained improperly, falsely, or illegitimately, or counterfeit or suspected counterfeit entries. Entry and draw dates: entries shall be distributed beginning on or about June 13, 2016 and until August 13, 2016. Entries will be accepted by the Sponsor beginning August 1, 2016 and ending August 13, 2016. Winners will be chosen on or about August 16, 2016 and announced via the Sponsor's social media outlets (Facebook, Twitter, website, and other online presences) within ten (10) days, and shall be contacted directly as per Section 5. 3. Eligibility: The Contest is open to individuals who are eighteen (18) years of age or older at time of entry, reside within Canada (excluding the province of Quebec or any other jurisdiction where the Contest is prohibited), possess a valid Firearms Possession and Acquisition License (“License”) with an expiry date of no more than sixty (60) days after the draw date, and have not been prohibited from possessing firearms or explosives by any municipal, provincial, or federal court of Canada. By entering, Participants acknowledge the Prizes are controlled articles subject to regulation under the Canadian Criminal Code, the Firearms Act, the Explosives Act, and the Explosives Regulations 2013 (“Controlling Laws”) and that the Sponsor and their Partners and Releasees are bound first and foremost by the Controlling Laws in the distribution of the Prizes. If the Winner becomes subject to a prohibition on firearms or explosives by a municipal, provincial, or federal court of Canada or their License is seized, revoked, or otherwise rendered invalid during the delivery period of the Prize the undelivered Prize shall be immediately forfeited without further compensation. By entering, Entrant consents to use of his/her name, biographical information and/or likeness for purposes of advertising and trade without further compensation, except where prohibited by law. All federal, provincial, and local laws and regulations apply. Void where prohibited by law or regulation. Winning criteria: Winners will be drawn on or about August 16, 2016 via random draw from all received entries. In the event an invalidated, incomplete, corrupted, or counterfeit entry is drawn it shall be discarded and the Prize immediately drawn again. All remaining entries shall remain undrawn for not less than fourteen (14) days from the date of drawing in the event that the original Winner is either: A) discovered to be ineligible as per Section 3; B) unable to be reached by telephone, mail, or email within ten (10) days; and/or C) it comes to the attention of the Sponsor that the original Winner obtained or submitted the entry under false, misleading, or illegitimate pretenses, in which case the Prize shall be redrawn within forty-eight (48) hours and the new Winner suitably notified. The Sponsor's decision on all matters is final. Winner notification: Winners will be identified within ten (10) days of the draw date via the Sponsor's various online media outlets (Facebook, Twitter, website, forums, etc.). Winners shall be contacted by telephone, mail, or email within ten (10) days of the draw date. Winners may alternatively contact the Sponsor by same methods. Each Winner may be required to sign a Winner verification form and liability/publicity release. Each Winner must respond to notification within seven (7) days; the completed verification/release must be received within fourteen (14) days of the date mailed or emailed to the potential Winner, or the Prize will be forfeited. Prizes shall be sent to the Winners within fourteen (14) days after receiving the completed verification/release form. Odds of winning: The odds of winning depend on the number of entries received by the Sponsor. Prizes and distribution: One Prize of “Ruger Precision .308”. Approximate retail value is $1600.00. Prizes are distributed equally across Canada. Prizes must be accepted as awarded and may not be provided to an alternate recipient (for example, in the event the Winner is or becomes ineligible to receive a Prize), transferred, or redeemed for cash except as specifically provided for herein. Winners are solely responsible for all applicable federal, provincial, and local regulations concerning the acceptance and use of the Prize including but not limited to compliance with the Controlling Laws as they are applicable the Prize. No Prize shall be given to a Winner until his or her eligibility under Section 3 has been positively established by the Sponsor and/or its Releasees. Winners are responsible for all costs or expenses not specifically exempted herein. No more than the stated number of Prizes will be awarded. The retail values set out above are based on approximate values in Canada at the time of printing of these Official Rules. All estimated retail values do not include applicable goods and services tax, provincial, or sales and use taxes. Winners are not required to pay such taxes upon receipt of the applicable Prize. All other taxes on Prizes or compliance fees (for example, cost to obtain or renew a License) other than taxes specifically referred to in these Official Rules are the responsibility of the Winner. Each Winner must provide their License information and home address for the purposes of compliance with the Controlling Laws, and physical verification may be requested by the Sponsor. Each Winner is responsible for providing the Sponsor with a physical delivery address (no PO boxes) and arranging to collect their Prize from the delivery agent. Prizes returned as undeliverable shall be considered forfeited without further compensation. No purchase necessary: To obtain a free entry and/or a copy of the Official Rules, write to Commonwealth Supplies Ltd., 8540 Greenall ave, Burnaby BC V5J 3M6. Each envelope must include a handwritten request for a entry. No mechanical reproductions of requests permitted, limit of one request per envelope with sufficient postage. All requests for a free entry must be postmarked no later than August 1, 2016 and received no later than August 13, 2016. All requests must include a postage-paid, self addressed return envelope. Limitation of liability: Sponsor is not responsible for typographical errors in any Contest-related materials; for any individual's inability to enter this Contest, including but not limited to unavailable network, server, or other connections, postal or delivery disruptions or failures, inclement weather, or force majeure; failed software or hardware transmissions; other errors of any kind, whether human, mechanical, or electronic, including lost, late, stolen, incomplete, illegible, damaged, misdirected, or unreturned entries; or for any damage to any computer related to or resulting from participation. The Sponsor reserves the right to modify the Contest at any time if it determines that for any reason the Contest cannot be run as originally planned. Sponsor reserves the right in its sole discretion to cancel or suspend the Contest should any of the foregoing occurrences corrupt or impair the administration: security, fairness, or proper play of the Contest. Participants agree that the Sponsor, its promotion partners, distributors, retailers, related companies, agencies, and respective employees or officers (“Partners”) shall not be liable for injury, loss, damages, legal consequences, or costs of any kind resulting from participation in this Contest or acceptance of or misuse of a Prize. Winners are solely responsible for the care and control of any Prize provided to them by the Sponsor and adherence to the Controlling Laws. Sponsor is not responsible for lost, late, undelivered, illegible, incomplete, mutilated, misdirected or postage-due rule requests, entry requests, or Prize claims. By accepting a Prize, Winners release the Sponsor and their affiliated and related companies, Partners, Prize suppliers, Prize sponsors, and their respective officers, directors, employees and agents, (“Releasees”), from any and all liability, loss or damage incurred with respect to the awarding, receipt, possession and/or use or misuse of any Prize and acknowledge that the Releasees have neither made nor are in any manner responsible or liable for any warranty, representation or guarantee, express or implied in fact or in law, including but not limited to its quality, mechanical condition or fitness for a particular purpose. Sponsor and its Releasees shall not be liable for any delay of delivery or failure in delivery of a Prize due to service disruptions, tampering, loss, or theft once dispatched and in the care and control of the delivery agent. General conditions: By participating in this contest, Entrants agree to be bound by these Official Rules and all decisions of the Sponsor, which are final. Participation in this Contest is voluntary and there is no obligation to participate, either by making a purchase or otherwise. Sponsor reserves the right in its sole discretion to disqualify any individual it finds to be tampering with the entry process or the operation of the Contest, to be acting in violation of the Official Rules, to be acting dishonestly, to be acting in a non-sportsmanlike or disruptive manner, or with intent to annoy, abuse, disrupt, threaten, or harass any person or entity. Sponsor reserves the right to periodically check, inquire, or investigate the eligibility or validity of a Winner's License, if required for compliance with the Controlling Laws. In the event there is a discrepancy or inconsistency between disclosures or other statements contained in any Contest materials and the terms and conditions of these Official Rules, these rules shall prevail, govern and control. In the event any terms or conditions of these Official Rules are found to be in contravention of a law pertinent to the operation of the Contest, those terms and conditions shall be deemed as null and void without affecting any additional terms or conditions. Dispute resolution:THIS CONTEST IS GOVERNED BY THE LAWS OF CANADA AND THE PROVINCE OF British Colombia. As a condition of participating in this Contest, Participant agrees that any and all disputes which cannot be resolved between the parties, and causes of action arising out of or connected with this Contest, shall be resolved individually, without resort to any form of class action, exclusively before a court located in British Columbia having jurisdiction. Further, in any such dispute, under no circumstances will Participant be permitted to obtain awards for, and hereby waives all rights to claim punitive, incidental, or consequential damages, including reasonable attorneys' fees, other than Participants actual out-of-pocket expenses (for example, costs associated with entering this Contest), and Participant further waives all rights to have damages multiplied or increased. Sponsor: CommonWealth Supplies Ltd., 8540 Greenall Ave, Burnaby BC V5J 3M6 (“Sponsor”). All questions regarding this Contest should be directed to the email address info@CommonWealthSupplies.ca.